In the previous post, we talked that how to lookup value and then returns entire rows of a matched value in a range. And this post will guide you how to lookup value and then return the entire column of the first matched value in a range in excel. How to use INDEX/MATCH to lookup entire column and retrieve the entire row. If you want to lookup value in a range and then retrieve the entire Column, you can use a combination of the INDEX function and the MATCH function to create a new excel formula. 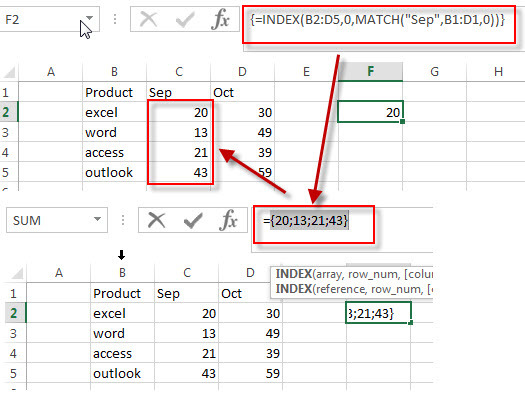 The MATCH function returns the position of the lookup value “Sep” in the range B2:D1. The third argument is set to 0, it means that the MATCH function will search the first lookup value exactly. The second argument is specified to 0 in the INDEX function, it means that the row number is set to 0, it will return all the values in the entire column and the position number of column is returned by the MATCH function. So this formula returns the values of the COLUMN 2 in the range B2:D5. If you want to lookup entire row and then return all values of the matched row, you can use a combination of the INDEX function and the MATCH function to create a new excel array formula. If you want to get the next largest value in another column, you can use a combination of the INDEX function and the MATCH function to create an excel formula.. The Excel MATCH function search a value in an array and returns the position of that item.The syntax of the MATCH function is as below:= MATCH (lookup_value, lookup_array, [match_type])….